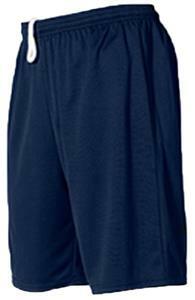 Alleson 5069P Adult Multi Sport Tech Athletic Shorts. This short is made of 100 percent eXtreme microfiber cationic colorfast polyester with moisture management fibers. It features a single ply body with cover hemmed leg openings 1 1/2" covered elastic waistband with inside drawcord and an adult 9" inseam. This short is made of 100% eXtreme microfiber Cationic colorfast polyester with moisture management fibers. It features a single ply body with cover hemmed leg openings, 1 1/2" covered elastic waistband with inside drawcord, and an adult 9" inseam. WAIST 28" - 29" 30" - 32" 34" - 36" 38" - 40" 42" - 44" 46" - 48"